Testing the swishy capabilities of the dress. It's not quite appropriate for an evening look, but if you want to know how I DIY-ed my Polka-dot nails, click here. 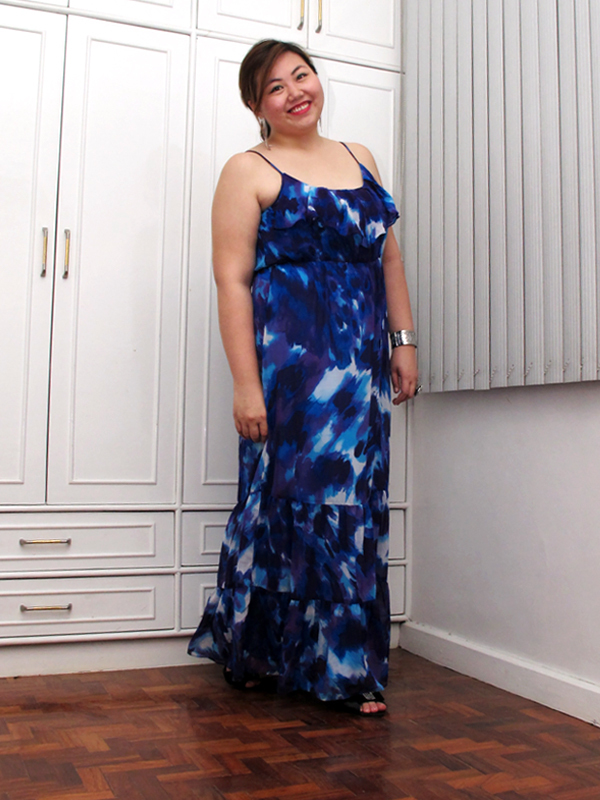 Before this blue dress, I had no inkling of what to wear to the launch of my sister's exhibit. She's among the Philippine School of Interior Design's (PSID) advance class students who will be graduating this November and could not be more excited to show off the result of her six-month long labor. Recently, she has been MIA at most gatherings, out first thing in the morning and always running around with a sour mood. I guess that's the stress and pressure talking as the deadline loomed. You can probably understand why I'm also overjoyed that she has crossed the finish line too! Just a day before the event, we went to The Off-Price Show that housed several brands at sale prices. Even though the lines were uber-long (took us 2.5 hours just to get to the cashier) and I got in big trouble for not coming home on time because my brother really needed the car, this dress makes it worth it (pampalubag-loob). I love the different shades of blue that look like they're been brushed or painted onto the fabric. The swishy factor also made me feel extra girly, the length was perfect for heels and the ruffles were a nice finishing touch. I'm so glad a lady who was petite and could have probably fit two of her into this dress saw and picked this dress from the back of the rack, so I could spot it from the line to the cashier. There was no other like it and I had a feeling it was exactly in my size. She held it reluctantly for a handful of minutes (probably thinking she could have it altered down to her size, while I was mentally willing her to let it go) before putting it back on the rack. Less than five seconds later, (yes, it was that fast) I had the dress draped over my arms like a prized baby. When you're in my size in this country where people are generally in US sizes 0-6, you have to develop a sharp eye and some sort of animalistic (ang wild, lol) instinct to know when a piece of clothing is right for you. If I had thought about it for longer and another plus-sized lady had snatched it up, then I would probably have spent the exhibit night wistfully thinking about the blue dress that got away. Is it just me, or does the header look just a little different? 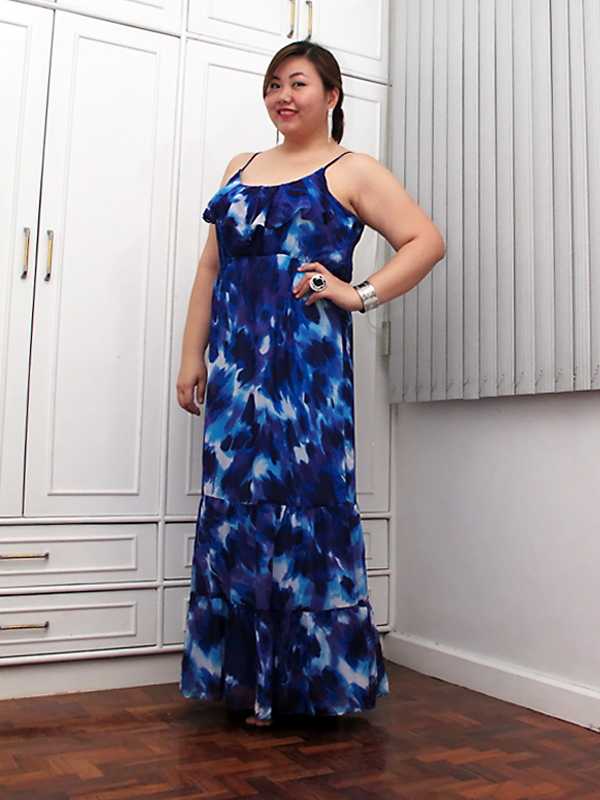 Anyhow, this is a beautiful dress as you are wearing my favorite color (blue) beautifully. Lovely shoes to go with it as you look glamourous. This dress is amazing! I love your blog and I am now following you! Thanks Bella! I'll visit you! You look lovely! 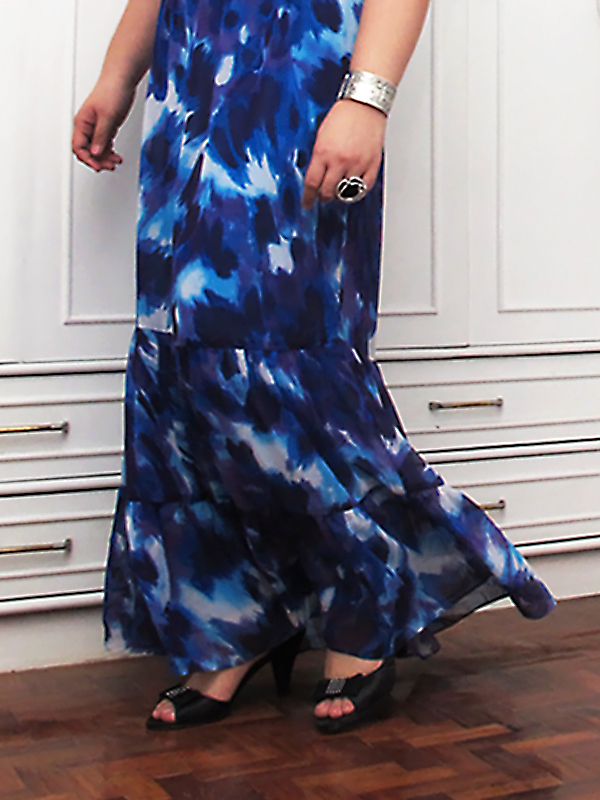 I absolutely adore the mix of blues in this dress!